The speeches that followed were moving to hear; presents were shared; and to end we all sang The Light of Sun is Spreading, with Nicole on the violin and Soleira on the piano, a full and rewarding sound. 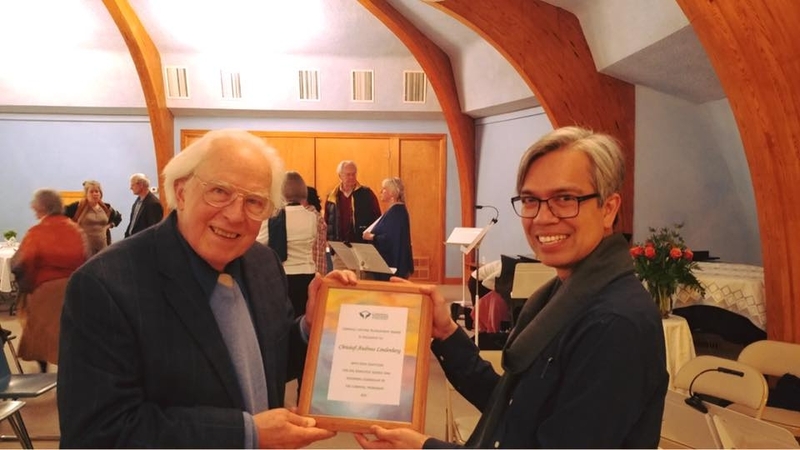 Elizabeth Howe: It was the initiative of Onat Sanchez-Schwartz (himself an experienced lyre player, and the secretary of the Camphill Association of North America) to honor Christof-Andreas Lindenberg with this award. Few have ever been awarded, and it was felt that as Christopf-Andreas has contributed to the life and work of Camphill on an International level, Camphill colleagues, friends and family should be invited from the Camphill Movement to this special ceremony. In addition, the time set for the ceremony was at the end of the Association meetings so that many were able to attend from across the North American region as well as from abroad. It speaks for how highly Christopf-Andreas is regarded that 90 people of all ages were in attendance, many driving great distances just to be at this special evening for a beloved and highly respected mentor and coworker. I was an outside guest from England, and I stood in awe of the amazing organization that went on behind the scenes. There were beautiful, grand flower vases round the room; roses, delicate thistles and green shamrock-like arrangements to represent Christopf-Andreas' connections with England, Scotland and Ireland (he helped pioneer Camphill in Ireland). An exhibition of photos, Christof-Andreas' music publications and Camphill-related articles covering a large table was displayed. Included was the impressive Book of Those Who Have Died, which is Christopf-Andreas' exhaustive research of the dates and places of all those whose destiny linked them to Camphill who had died between 1939 and 2005, from Dr. Ita Wegman and Count von Kaiserlingen, to the smallest child. The housemothers had arranged for refreshments and the setting of the room, and the musicians had spent the morning madly rehearsing a full program of Christopf-Andreas' memorable and challenging music for lyre, bells and voices. Onat himself had organized an impressive framed award, and others had made cards and written letters to express their appreciation. Onat presented the award on behalf of the Camphill Association of North America and Christof-Andreas accepted it with a few gentle words. Five people then came forward to speak about their experiences living and working with Christopf-Andreas from different aspects. Soliera Wennekes, his eldest daughter, spoke about growing up in Camphill and the magic of the special family times, often early in the morning, and about “fairy toast” (a cornflake, with butter and jam!!!). John Clark (himself now an internationally renowned lyrist, composer and lyre teacher) spoke about Christopf-Andreas as his mentor of 40+ years, and the humble wisdom with which Christof-Andreas shared thoughts and research and listened to his students. I then gave an overview of Christopf-Andreas' many skills and attributes, placing them in a zodiacal and planetary format (he is a true Renaissance man), linking with John’s characterization by speaking of the sun-like quality of “Eternal Childlike Forces” that radiate through all Christof-Andreas’ endeavors. Next, Sonja Adams spoke for the Beaver Run housemother's group that Christopf-Andreas has participated in and advised in an honorary position for many years. Lastly Norma, his wife, spoke, bringing to light the many hidden ways that Christof-Andreas has served in Camphill for 66+ years. One outstanding fact is that Karl Konig commissioned CAL to make the foundation stone for the first Camphill Hall in Aberdeen. He designed and fashioned a double dodecahedron from copper, such that its proportions would nest exactly with the one Rudolf Steiner laid for the first Goetheanum. It took many rigorous geometric calculations, was a labor of love, and ensures the spiritual kinship of the two buildings in perpetuity. The evening was interwoven with Christopf-Andreas' music from all eras: Trio Piece (1967); From Morning to Midnight (1969); Lily’s Song for Voice and Lyre (2006) and The Bridge Song for Voice and Bells (2006-17), both composed for a production of Goethe’s Fairy-tale; three of Christof-Andreas’ now classic lyre exercise pieces, Explore the Lyre (1965-70); a seasonal verse of Rudolf Steiner’s set to music: The Light of Sun is Spreading (1962); and a final piece for lyre and bells, For Lent (2013-16). Naturally, we ended with wonderful refreshments and a chance for some to speak personally with Christof-Andreas, recalling many special occasions where his music has crowned the events, while others explored the exhibition of publications and photos down the years. Yet, the outstanding memory is of Christof-Andreas’ “few gentle words”. Not only did it feel as if we in attendance were the recipients of the award, but also the bearers of a legacy inspired, since 1950, by the work and ideals of Camphill that CAL passed on to us, endowing us with courage to carry it into the future. Truly the purest quietest tones resound the loudest in eternity!!! Elizabeth Howe was a Camphill co-worker from 1971 to 2013 in England, Scotland and California. She is now a self-employed therapeutic musician in the UK, playing the lyre in hospitals for the sick and dying.